A little green bee-eater dries out in the middle of a rainstorm at Kodiyakkarai Wildlife Sanctuary, Tamil Nadu. 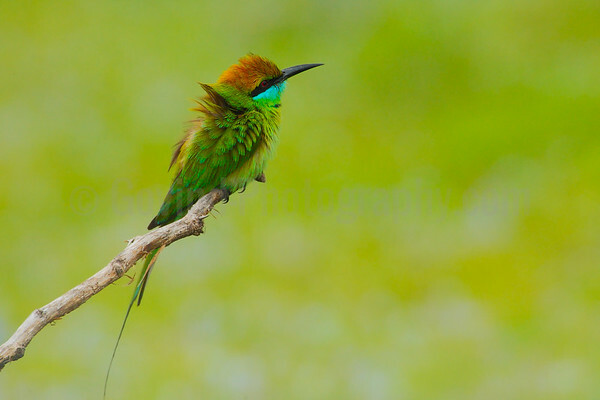 Beeeaters feed on insects which they catch on the wing. Rainy days make their life difficult as most insects rest during the downpour. A break in the weather brings out both insects and beeeaters. A greater prairie chicken male displaying at a predawn lek in Central Wisconsin. Prairie chickens belong to the grouse family. They used to be widespread across the country, but loss of habitat has significantly affected their population. 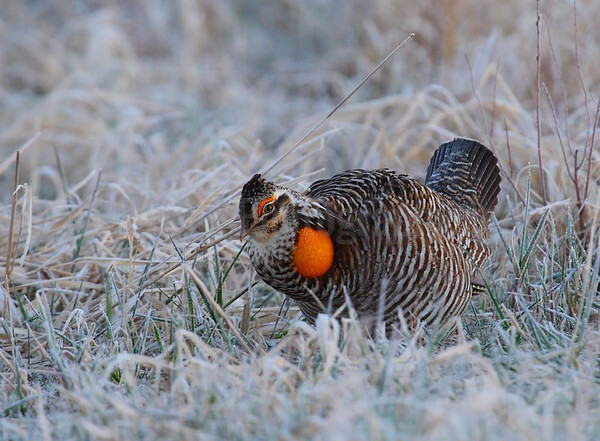 The prairie chicken leks in occur in early to mid spring when the weather in Wisconsin is still cold as seen in the frosted grass all around. 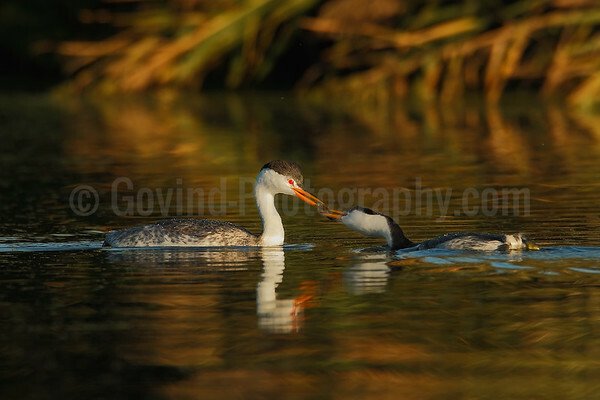 A parent Clark's grebe feeds a juvenile on a late fall evening. Clark's grebe juveniles stay with their parents through fall during which they learn to feed. During this time the parent grebe ends up feeding the juvenile often. 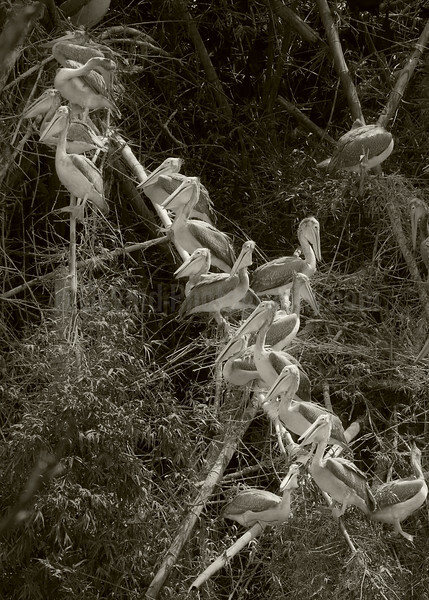 A flock of Indian spot-billed pelicans gather on a dead bamboo trunk to cool off in the midday heat. Pelicans use their large pouch as radiators to remove body heat. 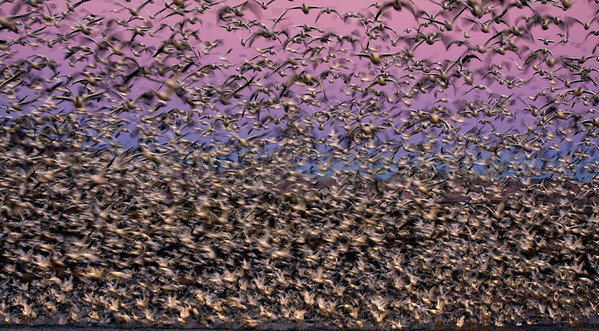 Roosting snowgeese at dawn in Bosque del Apache. With their large numbers and bright plumage, snowgeese are always pleasing to photograph as a group in the soft morning light. A male osprey takes evasive action as the female comes in to land on their nesting platform near the Snake River in Wyoming. 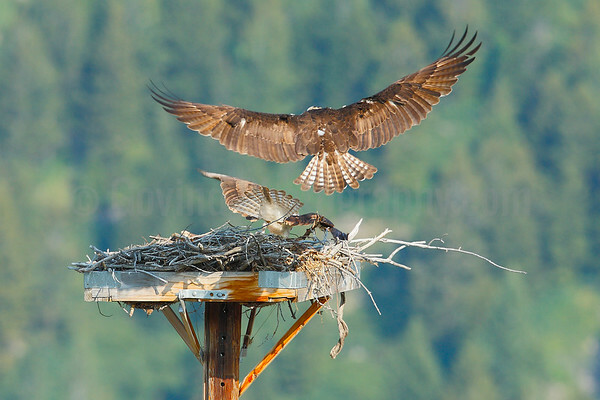 It was great to see the pair take turns bringing in sticks for their nest. Despite not being able to see the eyes of either bird, I liked the image for the tension from the contrasting poses. Canada geese are often the first birds to arrive to their spring grounds and register their presence through loud honks. I could hear this trio's honks even at a distance one early spring evening and the wing beats as they came closer. 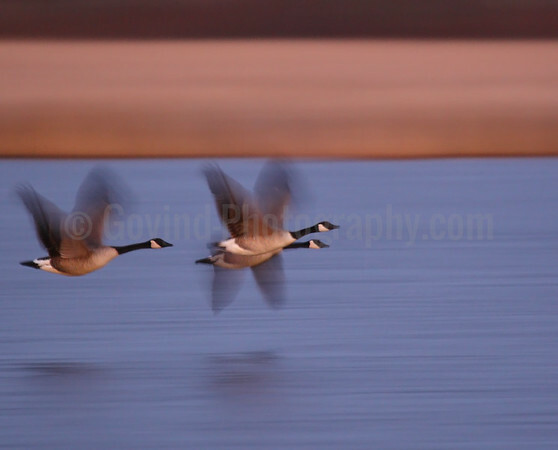 I captured this pan blur as they sped past me to their evening roost. The reeds and grass are still dry in early spring in Wisconsin and provide a nice background color palette. A flock of Indian cormorants cooling off during noon at Vendanthangal Lake. 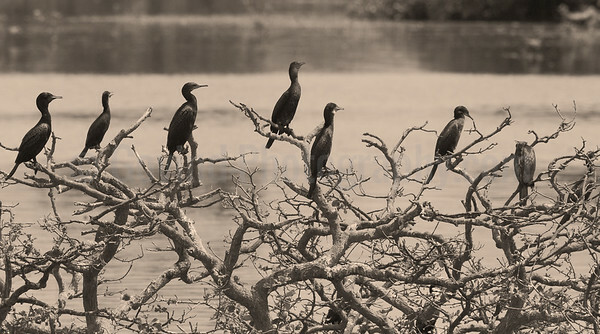 The branches of the tree provide a strong counterpoint to the cormorants. A flock of median egrets preen and socialize on the Kaveri river as they prepare to settle in for the evening. Preening is an important exercise for all birds to remove parasites and dirt. 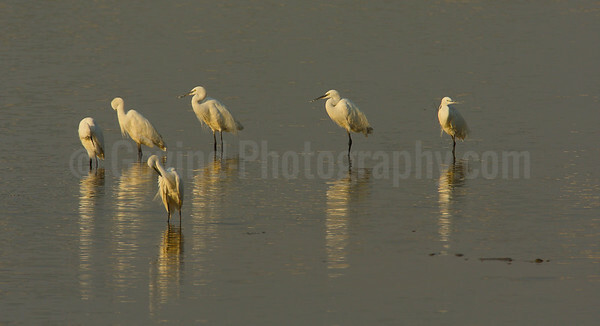 I liked the light and reflections, and the contrasting poses of each egret. A flock of Canada geese were feeding in grass along with a sandhill crane at Bosque Del Apache NWR. Occasionally they would all raise their heads to scan their surroundings for danger. Non-predatory birds usually feed in flocks where several pairs of eyes are available to spot signs of danger. I found the scene with golden grass and distant cottonwood trees very attractive. 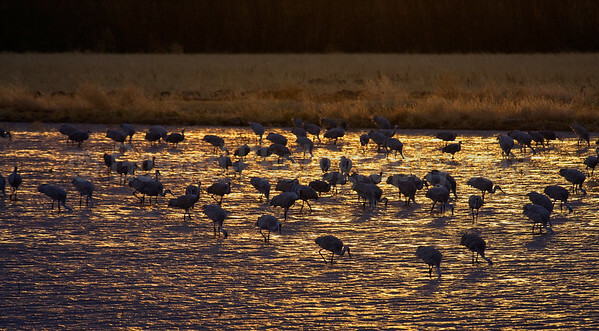 Sandhill cranes feed on the Rio Grande river at sun down. I was drawn to the texture of the water in the evening light. A white-breasted nuthatch observes me at a feeder after a snowstorm in Milwaukee. 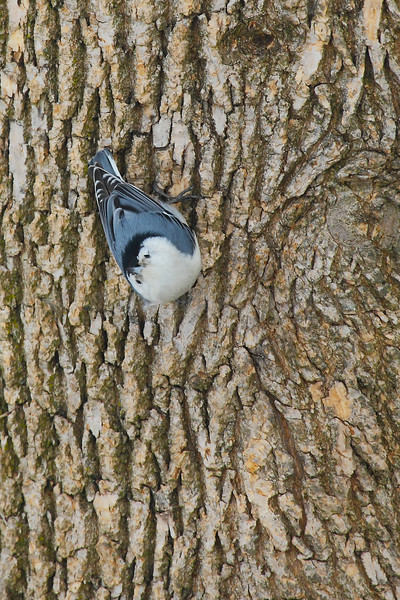 I found the texture of its perch as interesting as the nuthatch itself. 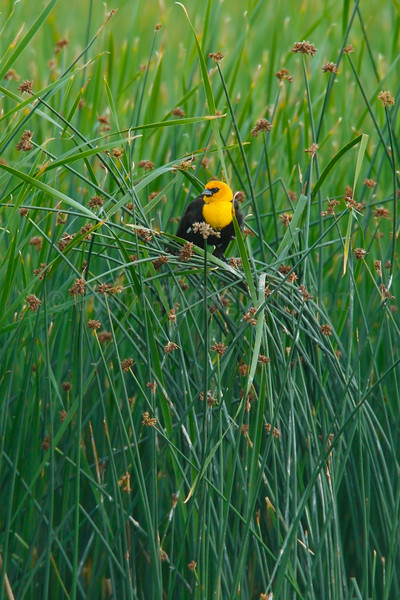 Male yellow-headed blackbirds are striking looking birds with their black and bright yellow plumage. One of the images I had envisioned of this species was in its spring habitat where the blackbird would stand out against the green surroundings. So, I was happy to see this blackbird fly into a pack of reeds and show up a few moments later. It stayed for a few seconds before darting back into the reeds, but that was enough for me to fire a couple of shots. 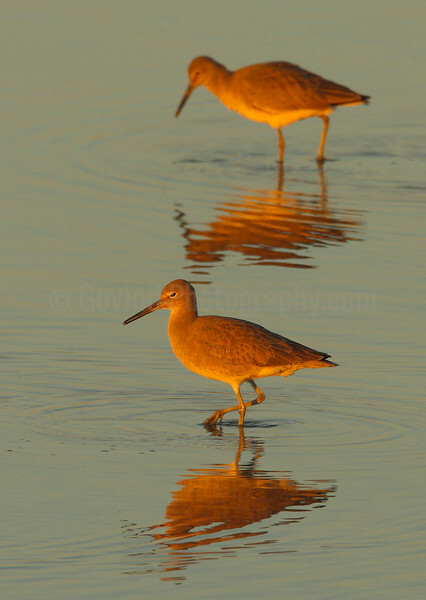 A pair of willets feed in the last light in a Bay Area harbor. The rays of the setting sun made these birds glow. Sandhill cranes gather to roost in the Platte River in the midst of their migration. Cranes roost standing up in shallow water bodies where any approach by predators is quickly audible. Here, the weather was cloudy and dark until the sun came out for a few minutes at end of the day and created an arresting scene. 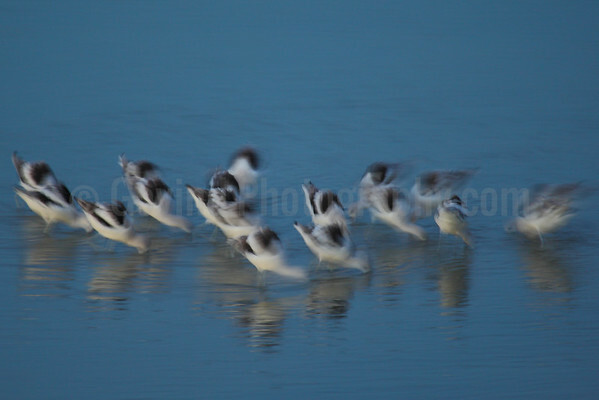 A flock of avocets feed at evening in the Great Salt Lake, Utah. The birds are starting to lose their breeding plumage. A raven flying out of its nest on a cliff in the southern Utah. In the desert southwest, ravens are a common species and build their nest out of reach of ground predators. 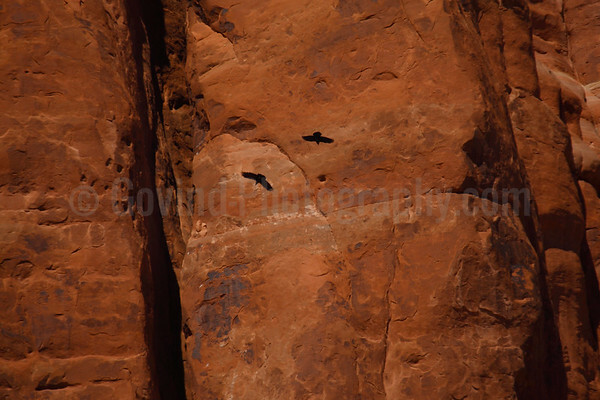 The birds and its shadow stood out against the wonderful red rocks providing a contrast of both scales and colors. 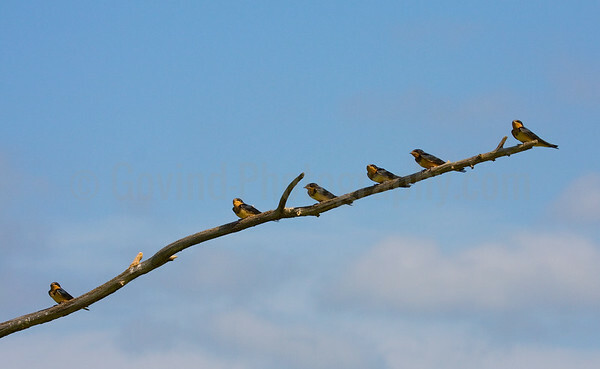 A flock of barn swallows settle down for an instant on a dead tree branch making for an interesting group shot. Initially the group consisted of the swallows on the right. As I was about to click, a single swallow sat down on the left end to balance the composition. A flock of flamingos are in the middle of their social dance at end of the day near Vedaranyam. The occasional red of their wings and elegant poses contrast well with the blue of the sea. 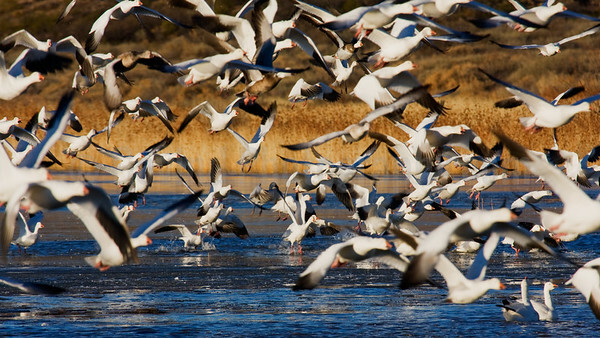 On one of the mornings at Bosque del Apache, I noticed an unusually large snowgeese flock portending a spectacular take off. I was not disappointed and with the sky providing a perfect backdrop, it was indeed a once-in-a-lifetime experience. 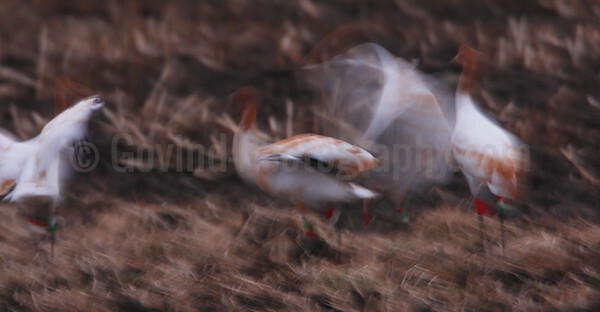 After creating images of snow geese in large numbers, I wanted to take a closeup of their take off. 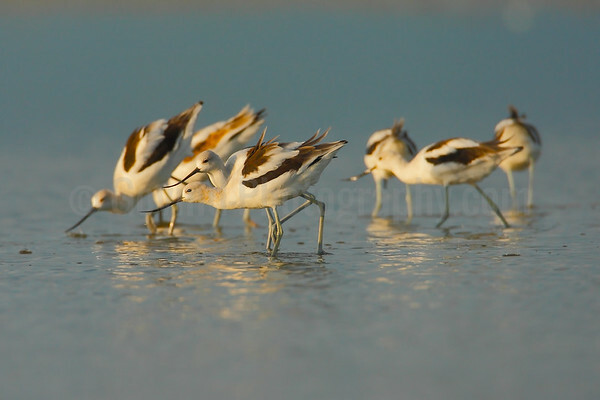 This smaller group along with the clear blue waters and warm morning light created an intimate scene.